The boys dress up in costume! This Convention Exclusive features Howard as a Jester. This 8-inch retro-style action figure features episode-specific inspired clothing and multiple points of articulation. Entertainment Earth Convention Exclusive! Your favorite stars of The Big Bang Theory appear in costume as they did in the Season 2, Episode 2 "The Codpiece Topology." Collect them all! Each figure is a convention exclusive that comes individually carded. Standing approximately 8-inches tall in episode-specific inspired clothing and a retro style that harkens back to the bestselling Mego action figures of the 1970s and 1980s, Bif Bang Pow! 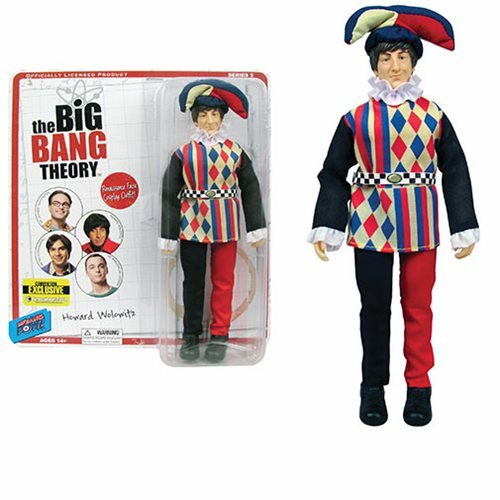 's fantastic line of plastic action figures based on the sitcom The Big Bang Theory features multiple points of articulation. If you're a fan of The Big Bang Theory, Mego, or retro figures in general, you're going to want them all! After all, it's the intelligent thing to do. Ages 14 and up.